I was up at 5.30am for dawn views over the river. Most of the eating places along the river were shut, but we had breakfast in the Kiwi Bakery. 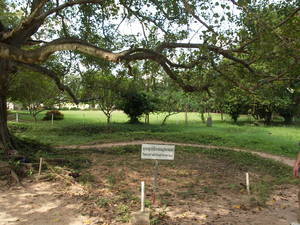 I booked a four hour Killing Fields + Tuol Sleng tour (Richard had been on one before). This didn't leave for some time so we walked around the central market, which had the usual range of textiles, clothing, electronics, and fresh food. There were five of us on the tour, in a little air-conditioned minibus. First stop was Choeung Ek, a village 15km to the south of Phnom Penh where some 20,000 people were killed by the Khmer Rouge and buried in shallow pits. 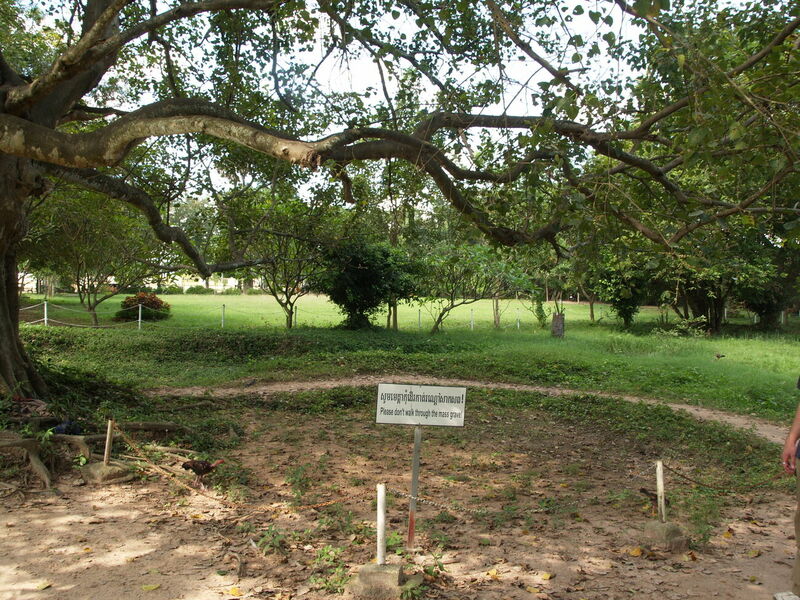 There is a pagoda honouring the dead and housing the bones of those who have been disinterred, a small museum, and fields where you can walk around the shallow depressions that mark where the pits are — only some have been excavated. Those killed at Choeung Ek were only a small fraction of the dead, but it has come to represent the whole Cambodian genocide, in a similar way to Auschwitz and the Holocaust. The landscape is strangely normal. There is a school right next door and the sound of children's voices wafts across the site, there are chickens wandering around, and there are nicely tended lawns. If it wasn't for the "Please don't walk through the mass grave" signs, the shallow depressions in the ground would hardly be noticeable. 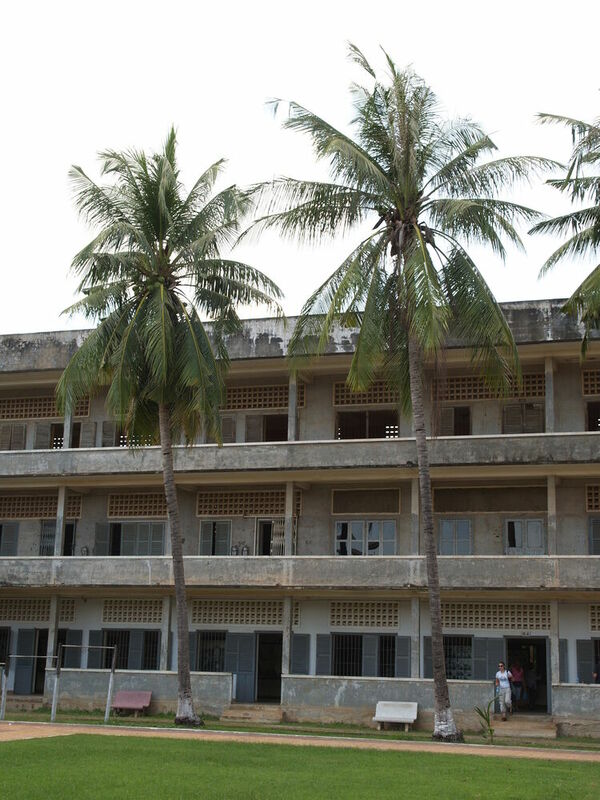 After that we were taken to Tuol Sleng, the school which the Khmer Rouge converted into the S-21 prison, where they tortured political prisoners before taking them by truck to Choeung Ek to be killed. 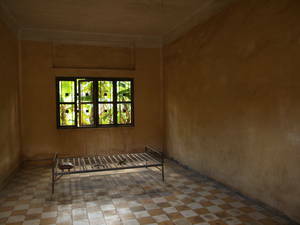 This has been converted into a Genocide Museum, which includes rooms full of photographs and information about the inmates, taken from the Khmer Rouge records. 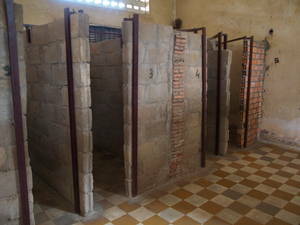 The prisoners in S-21 were chosen for special attention: elites, foreigners, etc. 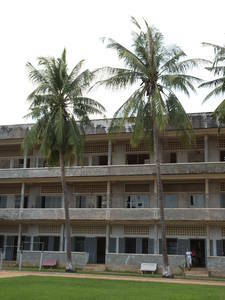 The buildings haven't been done up at all (the Vietnamese preserved tham as an illustration of Khmer Rouge crimes right from 1979) and are a grim relic. 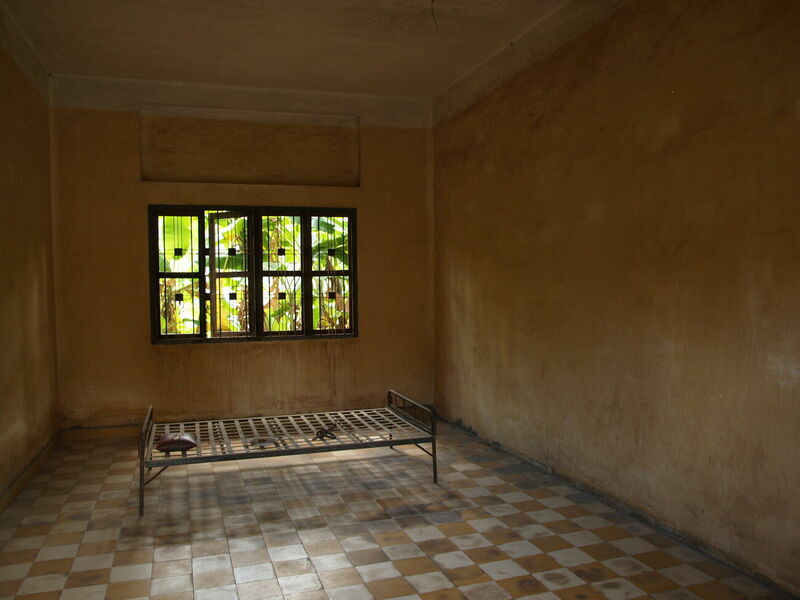 It was something of a relief to emerge into the sunlight of the yard and then into the normality of everyday life — Tuol Sleng is right in the middle of a Phnom Penh suburb, with a busy street out the front and houses surrounding it on the other sides. Cambodia is still finding justice for the crimes of the Khmer Rouge era, with the Extraordinary Chambers in the Courts of Cambodia, set up in 2006, having started hearings in 2009. 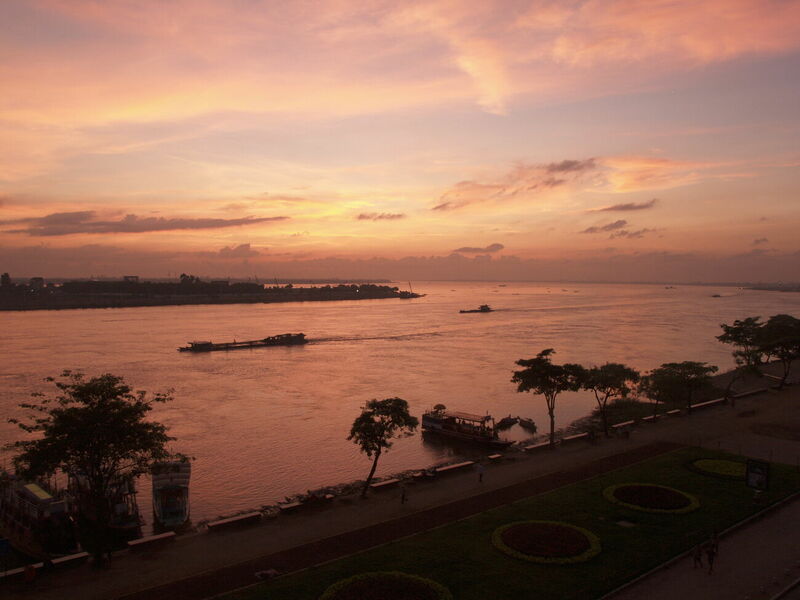 The first case it is hearing is that of Kaing Guek Eav aka Duch, who ran the S-21 prison. 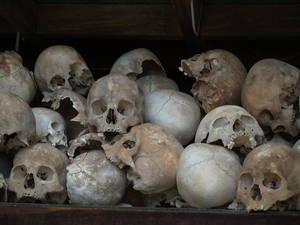 This tour is a dark way to spend half a day, but important if you want to understand modern Cambodian history.